Come for the views, discover infinite possibilities. This often-photographed site is 1.2 miles west of Highlands on U.S. 64. You can drive by the "veil" of water falling from 120 feet. Parking is nearby. Take the short, paved trail to the historic Wayah Bald Fire Tower. The tower offers a great view of the Appalachian Mountains in Georgia, Tennessee and both Carolinas. Directions: Bridal Veil is easy to find. Just look for the sign on U.S. 64, 2.5 miles east of Highlands in the Cullasaja Gorge. Directions: Located on U.S. 64-28 between Highlands and Franklin. 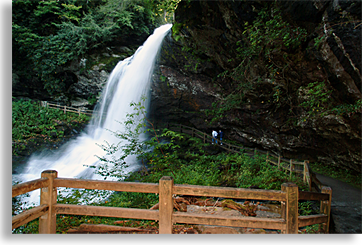 The lower portion of Cullasaja Falls is a cascade of water which flows about 250 feet down. It is located on the Cullasaja River at the lower part of the Cullasaja Gorge. 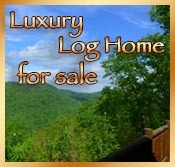 It is part of the Mountain Water Scenic Byway. Cullasaja Falls is only visible from your car; there is no adequate pull-off spot from the road. Directions: Cullasaja is located off U.S. 64, 11 miles east of Franklin, 9 miles west of Highlands in the Cullasaja Gorge. A lot of water pours over this wide waterfall. There's a well maintained path that leads a short distance down from the parking area. The path doesn't end at the falls but travels under the falls. Its a breath taking experience to stand under the falls and watch millions of gallons of clear mountain water pour over your head and before your eyes at a height of seventy five feet. Directions: On U.S. 64-28 four miles from Highlands. 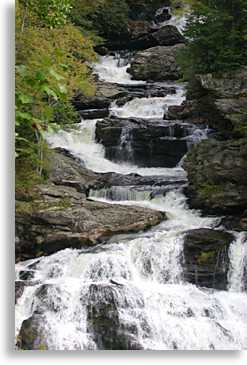 Located in the Blue Ridge Valley Area are a series of three large waterfalls, approximately 60 ft. in height and along the east fork of the Overflow Creek. The one mile foot trail down to the falls is steep with the same steepness coming back up. Directions: Three miles south of Highlands on N. C. 106. The dirt road is marked by a USFS sign. Many falls here. The Cullasaja River is rich in spectacular waterfalls. The Sequoyah Lake Dam is at the head waters of this series of falls. There's just 18 small falls within a quarter mile paralleling U.S. 64/28. Directions: Located two and a half miles northwest of Highlands on U.S. 64/28 west. The Cullasaja River runs along 64/28. This particular rush of water is actually a cascade. 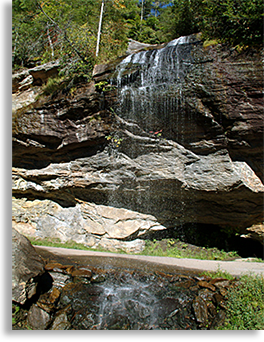 Also known as Clear Creek Falls, this waterfall is a high narrow drop that's visible from the overlook further down from Satulah Falls. Directions: Two miles south of Highlands on U.S. 28.